Close, and I would agree that the right notes are more important than the location. But in this exercise trying to get the location was part of it. 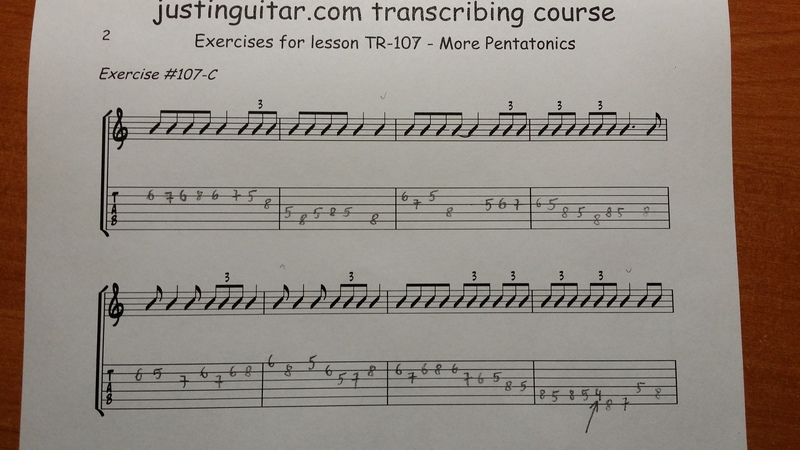 Second note on your transcription shows 7th fret on second string, F#. Justin's transcription shows a 3 on the second string, a D.
So that could be a typo on your part and you meant to write that as a 7 on the third string, which is also a D and the correct note in a different place or you got the note wrong. Same deal with the 6th note in the first bar. The last note in the first bar should be a Bb. You have an Eb. I would play Justin's versus yours bar by bar to determine where the notes are correct, bUT in a different location, versus where the notes are incorrect. Damn, so many typos in that first bar... You are right, both 7s, an 8 and a 5 should be placed a line lower (I don't know what I was thinking ). Anyway, are there any downsides to sticking with this particular pentatonic box compared to Justin's? I'm just working my way through this course, transcribing is something I knew would be good for me, but found it intimidating, but this step by step approach is brilliant. I do have a query, I'm on #107B and after working it out in a lower position I rewrote it in the 'proper' position, which thankfully matched the answer sheet, but before that, high on my new found 'talent' I decided the key had to be C... but the answer sheet shows it's Bb/Gm and now I'm confused! This no doubt is another area of my hotchpotch of knowledge that I need to work on, but am I completely at sea in suggesting Justin used C Dorian? I have to confess I'm just looking through a scales book until something matches, I don't know my Dorian from my Phrygian!